Lana Del Rey’s music video for “Love,” her most recent single, is quintessentially Lana. And by now, we know what that means: dreamy, slow-moving, and yellow-filtered, with a camera that lingers on the singer’s dramatic visage. And thematically, it makes sense. Del Rey is meditating—as she so often does—on the particular experience of being “young and in love.” This is not the realm of the teenage dirtbag. Del Rey’s lovers bask in a delusion of immortality, cocooned from worldly concerns. Her costume, which hearkens back to the flower children of the 1960s, deepens the affect of timeless youth. The video’s concept is simple, but appropriate. Del Rey sings before an audience comprised of late-adolescents. The camera frequently cuts to them frolicking: taking selfies, kissing, basking. They’re dressed carelessly but are nonetheless perfect. These shots could have been stolen from a Free People commercial, or perhaps a romanticized depiction of Coachella. 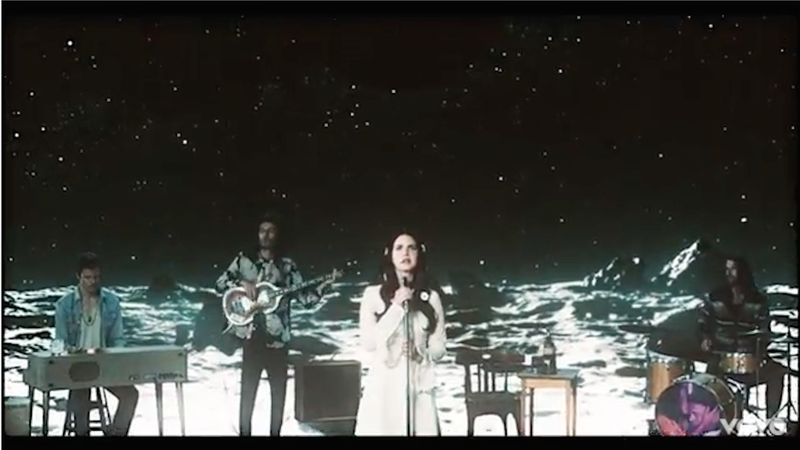 The video takes a turn midway, doubling down on Del Rey’s ethereal aesthetic. Suddenly she is on the moon — or a moon, and it seems that her audience is tumbling across alien terrain as well. The metaphor is straightforward enough: love catapults us out of time and space. We exist only to be beheld by the one who loves us in return; indeed, the experience is so transcendent we might as well be floating in space. There are more interesting videos, but I’m too enraptured by the song to care. This one is lovely, and it reminds me of why I listen to Lana Del Rey in the first place.